Making a major gift to the Critical Care Resuscitation Unit (CCRU) at the R Adams Cowley Shock Trauma Center was an easy decision for the Class family. In fact, their contribution felt less like a decision and more like a way to say ‘thank you’ for saving their son’s life. “We had to give back. Shock Trauma saved his life. It’s that simple,” says Jonny Class, whose son, Gavin, spent six weeks in Shock Trauma after collapsing from heat stroke during college football practice in late 2013. Gavin Class survived a traumatic illness thanks to the expert care he received at the R Adams Cowley Shock Trauma Center. He and his family showed their appreciation by becoming a partner in philanthropy to Shock Trauma and the University of Maryland Medical Center. When Gavin arrived at Shock Trauma, his body temperature was 108 degrees. The CCRU played a critical role in Gavin’s survival. Opening just three weeks prior, the CCRU serves as a resuscitation unit devoted to the critically ill. Gavin needed a liver transplant and was placed on the unit’s liver dialysis machine, the first in the mid-Atlantic. He was the first patient to use the device as a bridge to transplant. Jonny and his wife, Danielle, were not sure if their son would make it through the first night. But he did, and overcame many health challenges following his liver transplant, including pancreatitis, a collapsed lung, pneumonia, shingles, appendicitis, infections, and even lymphoma — which required four weeks of chemotherapy. As Gavin fought for his life, Jonny and Danielle struggled emotionally each day. While they received much support from their family and friends, they also found great comfort in the compassionate staff at Shock Trauma. Jonny recalls a nurse who stayed well past his shift to be by Gavin’s side the night following his transplant. Danielle remembers another nurse who stayed at Shock Trauma for 24 hours to ensure that Gavin received continuous dialysis. The couple even reflects on the kind words they exchanged every day with the parking attendants, custodians, and greeters at the front doors of the hospital. Gavin’s grandmother, Frances Jean Class, and his parents made a major gift to support data infrastructure at Shock Trauma’s CCRU. Every year, the CCRU accrues a significant amount of data on various diseases, and having the ability to analyze a large disease-specific cohort is a powerful tool in improving treatments and outcomes. The Class family supports Shock Trauma and the University of Maryland Medical Center in other ways as well. They made a significant gift to the University of Maryland Division of Transplantation’s Liver Research Laboratory. The Class Produce Group, a third generation family-owned business managed by Jonny, is a sponsor of the annual Shock Trauma Gala. The family also regularly attends the Ronny Maher Memorial Polo Match, a benefit for Shock Trauma organized by their friend, Ron Maher, Jr.
“We are very blessed and want to give back and help other people in any way we can,” Danielle says. This year marks Gavin’s five-year anniversary — or ‘liversary’ as his family calls it — since his transplant. Prior to his critical illness, Gavin prioritized health and fitness. Today, it remains a focus of his life. 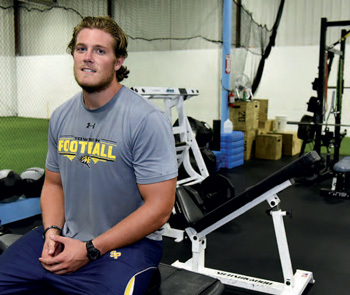 Gavin graduated from Towson University in the spring of 2016 with a degree in exercise science and now works as a strength and conditioning coach. He also competed in the World Transplant Games in Spain this past summer. Gavin’s motivation, however, does not end there. He and his parents have started the You Only Live Twice (YOLT) Foundation. They hope to inspire patients to live a healthy and active lifestyle following a transplant, educate others about organ donation, and one day open a facility in Maryland that provides temporary, affordable housing to transplant patients and their families. To make a gift in support of the Shock Trauma Center, please click here.